I'm afraid that yet again I'm starting a blog post with an apology for my recent absence- thank you for bearing with me. Today's review is of the Origins Spot Remover Blemish Treatment Pads which are based on the bestselling and award winning Origins Super Spot Remover Blemish Treatment Gel. I've never tried the Blemish Treatment Gel so I can't offer a comparison but nonetheless, I was intrigued to try the Blemish Treatment Pads. 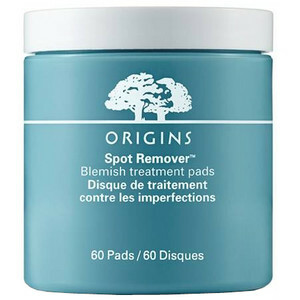 Origins Spot Remover Blemish Treatment Pads are presented in a somewhat bulky, albeit sleek looking tub, with screw top lid. As the name suggests, the tub contains pads- essentially cotton rounds saturated with product. I found the pads to be rather gimmicky and are an obvious spin-off on facial "cleansing" wipes- they may appeal on convenience factor but given that the tub is rather cumbersome, it's not ideal for travel. In fact, the smaller Super Spot Remover Blemish Treatment Gel packaging would make it a better choice for those who travel a lot. Having said that, the screw top on the tub means that it's a more functional packaging option to the plastic packs that wipes tend to be presented in because it helps to ensure that the pads are kept moist (although I did notice that the last couple in the tub had dried out). The pads have a strong, antiseptic scent which I actually rather liked. It gave the impression of a medicinal, clean product. They are practically fool-proof to use. Simply swipe over the affected area on clean skin. The inclusion of salicylic acid means that these should, in theory, work to treat spots. They have a gently exfoliating effect (hardly noticeable) and claim to help unclog pores, helping to fight and fade active blemishes. I didn't notice any improvement to my acne prone skin and when I suffered a breakout, it didn't appear to diminish any quicker than usual, although it was reassuring to "clean" the area. At £22 for 60 pads, I feel that Origins Spot Remover Blemish Treatment Pads are overpriced and I wouldn't repurchase. I feel that they are essentially a way in which Origins can extend the popular Spot Remover line. There are far better skincare products on which to spend your money. I also found it interesting to note that the Super Spot Remover Blemish Treatment Gel (which I reiterate, I haven't tried) is just £13 and I imagine it to inherently be a more concentrated version which can be applied in a more controlled manner. Thanks for the review. I think I would definitely hold off on purchasing this product now that I've read it. I'm a new GFC follower. Also following on twitter (@2Byoutify). Interesting review and I thought I was the only guy in the world who felt like this. Its like they are in every corner of the insides of Macys waiting to pounce on the "Natural" crowd with their overpriced junk. One more thing, a big thanks also for being one of the brave to show Origins not so 'bright lights' of the skin industry. I agree - it does seem pricey. Salacylic acid is known to clear pores and Saw Palmetto can help control oily skin but products that do exactly the same can be found at a much lower price. skin care is so expensive! I think I have perfectly come across to the site where my problem would probably be answered. I have couple of spot on my face and I am worrying of how I could get rid of these. Is this really effective. If so, then I would love to have this one. Thanks.